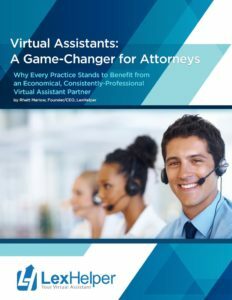 Atlanta, GA – Legal virtual assistant startup LexHelper offers a tech solution to the thousands of lawyers facing the challenges of a solo practice. LexHelper’s trained and professional staff coupled with new software wants to remove “Office Manager” from the many hats solo practitioners must wear on a daily basis. “About half of the lawyers entering the work force, work alone. They are entrepreneurs. That means talking with potential clients, scheduling appointments, taking phone calls, billing and collecting while trying to actually practice law,” LexHelper founder and CEO Rhett Marlow says. Marlow believes the numbers support the enormous need in the legal community. Each year more than 55,000 attorneys are admitted to state bar associations throughout the U.S. Nearly half of all attorneys go into solo practice. 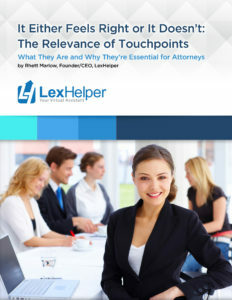 Those are the lawyers Marlow sees benefitting most from LexHelper. LexHelper provides support through live answering professionals and a system designed to reduce cancelled and “no-show” appointments. LexHelper professionals field common questions about the attorney, schedule appointments and follow-up reminders through voice, text and email. In addition, LexHelper collects initial consultation fees which ensures the attorney gets paid. Marlow, who has taken part in several successful start up ventures, sees the legal community as a place where new processes can dramatically increase efficiency. You can learn more by going to the website LexHelper.com or calling 877.828.5546.